It is one of the most exclusive fabric in the fashion industry for one to work with. These shiny and designer brasso sarees sparkle the entire atmosphere of the wearer. With your party list increasing day by day the need for new attires grow with it, considering emergency situations like these Peachmode has come up with an entire collection of latest brasso net sarees. If you wish to buy these designer & stylish brasso sarees online with high-tech fabric and rich quality then subscribe with us and start adding them to your wishlist folder. We also have come up with brasso chiffon mix sarees. 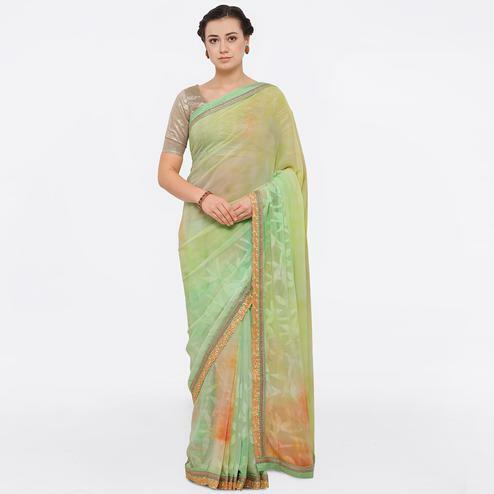 Apart from these, brasso sarees come with exclusive patterns, designs, digitized prints and patchwork, which makes the saree look adorable and classy at the same time. You need to take good care of these sartorial choices of yours. For the proper care of brasso sarees dry cleaning is prefered. If you are selecting hand wash at your home then wash it in cold water with a little detergent and let it on to dry naturally. Later, you may unwrinkle it with mild heated iron and store it in your wardrobe. This benevolent fabric is made out of an acid itch process that involves burning of fabric in order to get multiple textured designs and patterns. The fabric has been so inspiring which made number of top designers to work with it. Apart from sarees the fabric can be constructed into an embellished bridal lehenga to long anarkali suits. Major works like kundan, phool patti goes amazingly with this fabric and onto any of the ethnic wears made from it. Reserve some space in your wardrobe for some exclusive brasso saree designs. These medieval era sarees are worn in traditional parties to give a royal look and to flaunt your elegance.